Plays an important role in the functional organization of mitotic chromosomes. Exhibits low basal ATPase activity, and unable to polymerize. 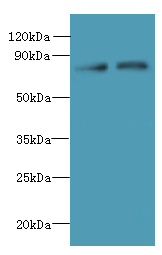 ACTR8 Polyclonal Antibody. Unconjugated. Raised in: Rabbit.